/u/jakkdata: Are there signs or leading measures that suggest widespread water shortage in the next 20 years? Professor Sedlak: I’m going to answer this one in two parts: First, for countries with stable populations, lots of existing water infrastructure and plenty of money there are likely to be problems with water supply like the one that we have been experiencing in California. In particular, places like the Colorado River basin, Central Texas and California will see shortage as cities continue to expand and water rights battles transpire. These types of shortages can be addressed by better policies. The other part of this question, and the one that is more worrisome, is related to the parts of the world that have rapidly growing populations, few existing investments and economic activity that cannot support expensive solutions like desalination. The World Bank recently put out a study showing how shortages by the year 2050 (and sooner) will affect the economies of Africa, India and Asia. Their point was that smart investment could minimize the pain of these shortages. So yes, there is plenty of reason to expect widespread shortages in specific parts of the world in the next 20 years. /u/ arcaneatheist: As a pretreatment professional, we’ve seen a large disinvestment of the program at the national level even though the program has been proven to be one of the most effective in restoring the nation’s water bodies. I’m interested in the future of direct potable reuse as employed recently in Wichita Falls, TX. If this practice is projected to increase around the country, how do you see the role of pretreatment professionals evolving over the next couple of decades? Professor Sedlak: Pretreatment (for those who are not in the know, subjecting commercial or industrial waste to some sort of treatment before putting waste down the sewer)–indeed an important issue. Most people don’t realize that we still use our municipal sewers as chemical waste disposal systems. This wasn’t noticeable back in the bad old days when we just piped everything to the nearest river or estuary but now that we want to turn our sewage into drinking water we need to be more careful about what we put down the sewer. In Orange County, home of the oldest potable reuse project in the US, we worked with the local sanitation agency to identify the sources of the carcinogen NDMA that was showing up in the recycled water. It turned out that a substantial fraction of the compound was coming from a small number of metal-plating factories that were using a dithiocarbamate-based chemical to remove metals. In this case, it wasn’t the dithiocarbamates themselves, but a trace impurity in the industrial grade chemicals that they were using that was the source of the NDMA. With talented pretreatment people this problem was easy to fix. It could not be done simply by sitting in an office looking at paperwork. More recently the Orange County plant has observed pulses of acetone coming down the sewer. This is a problem because the reverse osmosis membranes that are their main barrier to chemicals cannot remove uncharged, low molecular weight compounds. There is definitely a need for better pre-treatment programs and enforcement to protect these new sources of drinking water. You have a bright future as a pretreatment specialist, especially if you are willing to get your hands wet (and dirty)! /u/sarahbotts: Should people be using water filters? If so – is there something specific to look out for? I live in the city and you can definitely tell when water tastes off. Professor Sedlak: Your water tastes “off”. No need to panic–it’s usually a problem that is easy to fix with an activated carbon water filter. Typically when water tastes strange it is due to part-per-trillion levels of compounds with very strong tastes and odors like geosmin (one of the main compounds that give beets their earthy flavor) or 2,4,6-trichloroanisole (the compound that also makes wine taste “corky”). These compounds can ruin the taste of water but don’t pose a health risk at these low levels. They are well removed by carafe or under-the-sink water filters. Sometimes water tastes off because there is too much chlorine or chloramine in it. This is also removed on activated carbon filters because it reacts with the high surface area and catalytic surface sites. A well run water utility should be able to manage this issue by using ozone to remove the organic compounds or taking better care of the pipe network. But as we all know, not every water utility is well run. So go ahead and use a filter if you don’t like the taste of the water. Just don’t forget to change it every now and again. /u/Fraagen: I’m considering majoring in Environmental Engineering. What is the most rewarding aspect of your job? Is geological engineering similar? Any tips for a new engineering student? Professor Sedlak: Rewards: Where to start? Playing a small role in making the world a better place is at the top of the list for me. After that, I really like the ability to apply fundamental knowledge from different sciences (e.g., chemistry, biology, physics) to solving practical problems. Some have taken to calling this discipline “environmental engineering science” to emphasize the idea that we are using a mechanistic understanding of the way the world works instead of simply using an empirical approach as the engineers did in the early days. Another aspect of the field that I find particularly compelling is trying to learn about the way that natural systems work and employ those lessons to improve water quality. We do this in our research on constructed wetlands where we try to create environments where photochemical reactions and microbial processes that happen slowly in real wetland systems can be harnessed to work for us in low-cost treatment systems capable of treating the water from an entire river. I don’t think that I would recommend being a geologist or someone who spent their time trying to figure out how to get more oil and gas out of the ground. If they don’t turn their attention to putting the carbon back underground (and not taking any more stuff out) I can’t see much of a long term future in it. Tips? Don’t shortchange your training in fundamental sciences. You can always learn the more vocational parts later. You will never teach yourself organic chemistry or physical chemistry in your spare time. /u/Kongsfjorden: Geologist here! What do you think of antibiotics as an emerging contaminant? 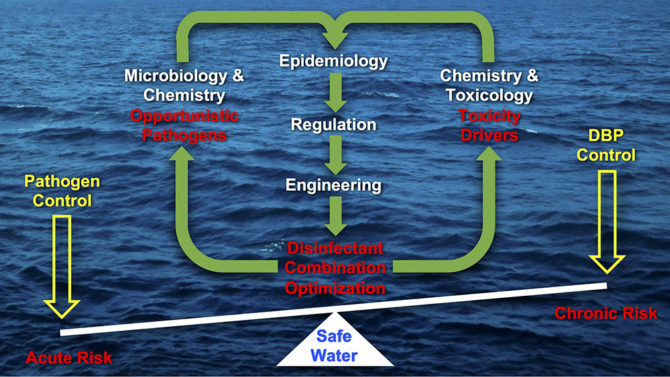 Professor Sedlak: For those who don’t know,”emerging contaminant” is a term used to describe a contaminant that we should be monitoring and possibly controlling because it could pose a risk to public health and/or the environment. When I first started thinking about chemicals that are present in municipal wastewater (way back in 1998) I thought that antibiotics would be a major concern. But after reading some of the literature, I concluded that antibiotic resistant organisms, mainly produced by people who do not take their whole course of medication and overuse of antibiotics in agriculture, are the bigger concern. The levels of antibiotics in wastewater just seemed like they were too low to really select for resistance. Recently I have become more concerned about this issue as scientists have begun to learn more about gene transfer and antibiotic resistance selection in the environment. There was an excellent review/feature article on this in ES&T in 2014. Why do we keep using our drinking water systems in the U.S. to dispose of about 260,000 tons annually of hydrofluorosilicic acid, a by-product of phosphate fertilizer production that meets RCRA criteria for hazardous waste, and a substance shown in peer reviewed literature to increase lead leaching from plumbing (note: Pb) fixtures and lines as well as blood-lead levels in children?